Tonight on Kumkum Bhagya, Prachi and her cousin go to Delhi to attend their new college. However, Prachi almost gets run over by Abhi. He scolds her. In the latest episode of Kumkum Bhagya, we saw that Prachi and her cousin win a scholarship at a college in Delhi. However, Pragya is afraid to send her away to the city where Abhi lives. She is reminded of their separation and how she had decided to never enter his life again. Dadi asks Pragya to consider and think of Prachi’s future and not their past. Prachi’s lover Rohit visits Pragya and others at their home. He tells them that he loves her and wishes to marry her. But Prachi refuses and thus, Pragya asks her to slap him and set him straight. Tonight’s episode begins with Dady trying to tell Pragya to not keep looking back into her past. She tells her to allow Prachi to fly into her future and send her to study in the college in Delhi. Pragya walks away and starts packing Prachi’s bag. The mother-daughter share an emotional moment. On the other hand, Aliya is showing a singer’s talent to Abhi. He has now become a businessman and has opened a music company that supports new and upcoming artists. Aliya informs Abhi that he is about to receive an award. Everybody is elated to get this news! Just then Riya enters. She tells everyone that she is the lucky charm because of whom the company is running successfully. He asks Riya which award she wants and she tells him that he is her award! Dasi asks everyone to organize a party to celebrate Abhi and Vikram’s victory. Prachi and her cousin are on their way to Delhi in a bus from Hoshiyarpur. Prachi starts crying as she misses Pragya and her caring ways. Prachi starts thinking about how Pragya used to be concerned about her. Meanwhile, Pragya keeps looking at her phone waiting for Prachi’s phone call. Dadi tells her that the bus would have gotten late and she would call when she reaches when she is at the location. Dadi tells Pragya that she is worried as if Abhi is waiting to kidnap Prachi. She says even the destiny has forgotten that Prachi even has a father. Prachi and her cousin reach Delhi. Prachi thinks that Delhi is the city where her mother lost everything. She wishes that she never meets father for she thinks he made her mother lose everything and even hurt her. Abhi is on his way to the awards show, but Riya has a fashion show to get to. Abhi tells her that if she doesn’t come, he won’t go to the event. Abhi is about to run Prachi and her cousin over with his car. Pragya gets an intuition that Prachi is in trouble. In the next scene, we see that Abhi gets down from his car and walks towards Prachi. He calls her a stupid girl for walking in the middle of the road so carelessly. But Riya thinks he is scolding her, as she is on a call with him. But Abhi tells Riya and tries to make her understand that she is his daughter, but the words come out just when he stops in front of Prachi. Abhi scolds Prachi and asks her if she was trying to commit suicide. He asks her to be careful and that she won’t get lucky each time. He tells her to think about her parents next time she steps out and be safe. Prachi talks to herself and thanks Abhi for saving her life. However, Prachi’s cousin gets angry because Abhi scolded her so much as if she is his daughter. But Prachi tells her cousin that Abhi can never be her father. Prachi says her father abandoned her soon after birth. 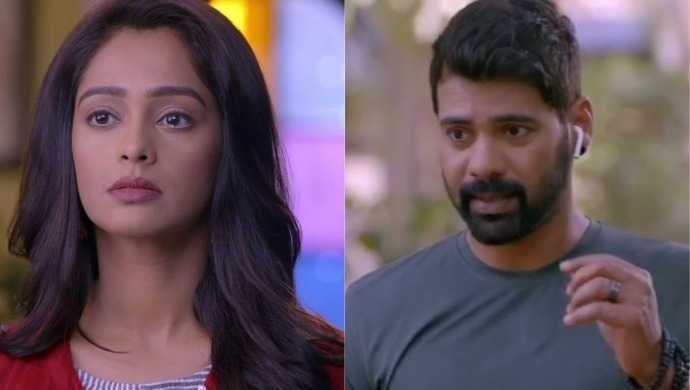 Abhi apologizes to Riya for keeping her waiting. Prachi and her cousin don’t find the address. Their bags get stolen. Abhi thinks about Prachi and wonders if she is new to the city.